I think I can say that breakfast is my favorite meal of the day. For sure if its something cheesy. If only I were a morning person like my mom! (But then again, I’m not a night owl so maybe I am a morning person?) Maybe I’m neither. Haha. 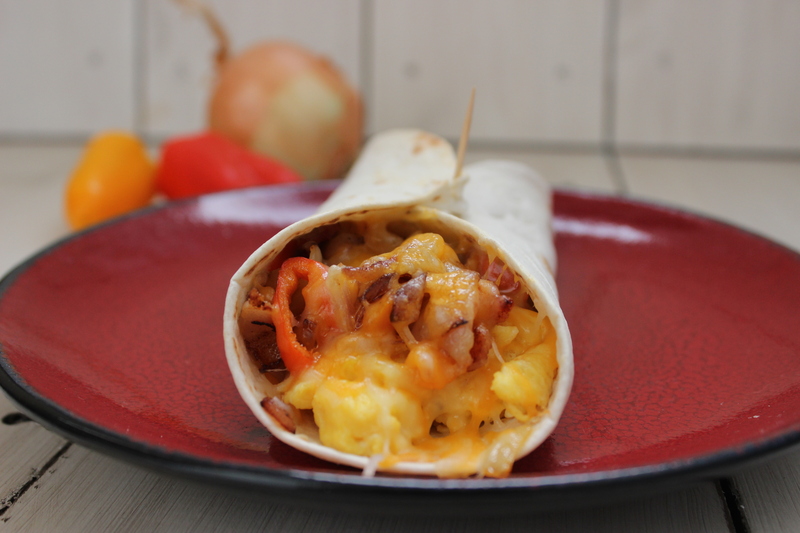 But all that to say, these amazing burritos are quick enough that you can oversleep and still have them ready on time before your husband rushes out the door for work. Its one of our all time favorites that I try to make once a week. The variations you can make are endless! We like them with black beans, peppers & onions, sausage one week and bacon the next, ham is always good too. I don’t have amounts for you but I usually make 2 eggs per burrito. I like to buy the smaller flour tortillas for these. Any size will work, you’ll just need to adjust your ingredients. I always put them under the broiler for a few minutes to crisp the tortilla. Its SO much better! These also work great for camping! Just wrap each filled burrito in aluminum foil. Place of fire and warm until cheese is melted. Turn oven to broil. Prepare scrambled eggs with cheese. Meanwhile, fry meat, onions, and peppers. Spread a thin layer of sour cream down the middle of each tortilla. 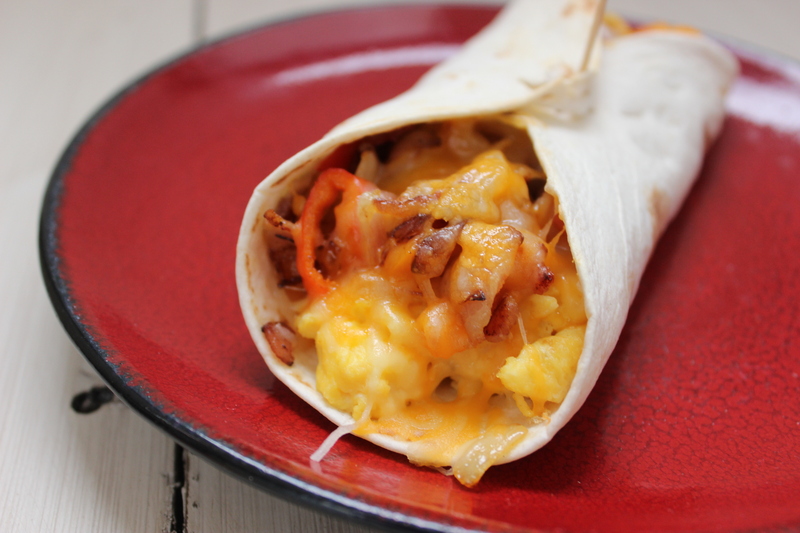 Top with eggs, meat, vegetables, and shredded cheese. Fold tortilla closed and place toothpick in center to hold shut. Place burritos in glass dish and broil for a few minutes until the cheese is melted and tortillas have reached desired crispness. Serve warm with additional sour cream and salsa! Joy, you are so getting me out of my cooking rut! :)I love it because I don’t have any doubts that the results of your recipes will be delicious! !